House with pool located in vidreres at 8 km from the beach of Lloret de Mar. It has 3 bedrooms (1 suite with matrimonial bed of 150x180cm and shower, a room with double bed of 135x185cm, and a room with 1 single bed of 90x180cm and a trundle bed (90x190cm)). Living-dining room (TV) with balcony exit, equipped kitchen (gas, oven, microwave) and exit balcony, 1 other bathroom with shower (washing machine). Garden with swimming pool and barbecue area. Parking for one car. Only the 1st floor is rented. Apartment located in Pals, in a residential complex with swimming pool, 400 m from the beach and the center of town. First floor with elevator. It has 3 bedrooms (1 with double bed 150x190cm and exit to a terrace and 2 with 2 beds of 80x180cm in each), a living room with access to a terrace, kitchen (gas stove, oven, microwave, washing machine) , 2 bathrooms (with bath) and garage. Apartment located in Llafranc at 250m from the beach and downtown. Firts floor without elevator. Simply furnished. 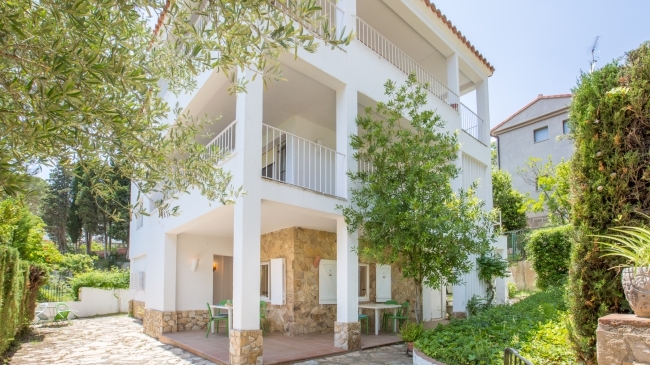 It has 3 double rooms (6 single beds (2 beds of 90x190cm and 4 beds of 80x 180cm) 2 of them are suites with bathtub, kitchen (ceramic hob, oven, microwave, washing machine), living-dining room with TV and fireplace and access to the terrace. In a residential area with communal pool and children's area. Covered outdoor parking. Villa Las Palmeras is divided into 2 apartments, with separate entrances to each of them. The house (180m2 (plot 900 m2) is situated in a quiet area of Lloret de Mar (Serra Brava), just 3km from the beach and 7 Km from the centre of Tossa de Mar ( 4.5 Km from the centre of Lloret de Mar). The distribution is as follows: The lower apartment consists of a living room (TV, fireplace), a kitchen that is very well-equipped (dishwasher, microwave, gas stove), 2 bedrooms, 1 double and 1 twin (2 single beds) and 1 bathroom with a tub. The apartment above, has a large living room (TV, fireplace), open to a kitchen very equipped(dishwasher, mcrowave, vitroceramic cooktop), 3 bedrooms, 1 suite (double bed) and 1 bathroom with shower, and 2 double bedrooms (1 with a matrimonial bed, 1 with bunk beds). Another bathroom with tub. A lovely outdoor area, barbecue of work, swimming pool 7x3.5. Terrace. Wonderful sea views. Free WI-FI connection. The pictures of the beach do not correspond to the view from the house. Is Cala Canyelles, the closest beach to the vila. Cala Canyelles is a pretty stretch of the Costa Brava's coast with 500m of the characteristic coarse white sand beach of the area. Umbrellas and deck chairs are provided to rent as well as activities like pedal boats, parasailing, and water- skiing and canoeing. Also you can taste the Mediterranean food, fish and paellas, in the restaurant placed on the beach. Simple house divided into 3 independent apartments and located in Llafranc. This one (70 m2) is on the ground floor 200m from the beach and 150m from the city center. It has 3 double bedrooms (1 double bed (135x190cm), 4 single beds (90x190cm)), renovated gas kitchen (oven, microwave, dishwasher), 1 bathroom (shower), living room (fireplace, sofa bed) with exit to terrace. Quiet place. Shower, washing machine and hand washing without toilets outside. Wifi Internet optional (10 euros per week).